I frequently visit Albuquerque restaurants for lunch and have sampled dozens of dishes over the years, if not hundreds. 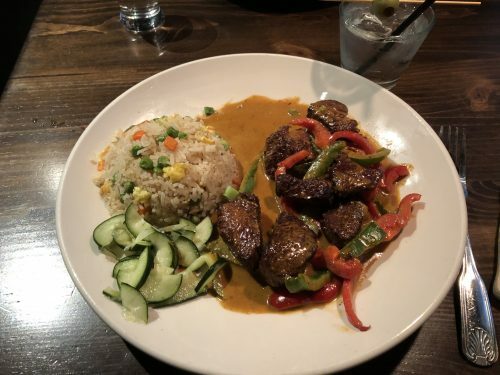 The image above is my favorite Albuquerque lunch of all times: Red Thai curry with sirloin steak, fried rice, and pickled cucumbers as prepared by the chef at Jinja Bar and Bistro at 8900 Holly Ave NE B, just off Paseo del Norte. I’ve probably dined on this fantastic dish twenty or thirty times, and it’s been perfect every time. Would you like to prepare this in your own kitchen? Of course you would. Here’s how. First, slice a cucumber very thinly and let it soak in rice wine vinegar for several hours. Go here to make the Saffron Rice, and feel free to add some parboiled diced carrots and peas. Go here to make the curry paste, then mix a half cup of it with a half cup of coconut milk in a pan, stir it, add some parboiled sliced red and green bell peppers, and heat it up, but don’t let it boil. Grill a sirloin steak to medium rare, then slice it into large chunks. To assemble the dish, mound the rice on a plate, add the pickled cucumbers next to it, and place steak chunks on the plate. Pour the red curry sauce and peppers mixture over the steak chunks and dig in! This will make two or three lunches.